Q.1) In which of the following state River Godavari is not flowing? Q.2) In which of the following state Ravi River is not flowing? Q.3) Shripad Yesso Naik belongs to ________ Constituency. Q.4) In Which state Korpa super TPS is located? Q.5) In Which state Koderma TPS is located? Q.6) In which state Kayamkulam Power Station is located? Q.7) In which state Sant Singaji TPP is located? Q.8) Which of the following national park is not located in Assam? Q.9) Which of the following wildlife Sanctuary is not located in Gujarat? Q.10) Which of the following wildlife Sanctuary is not located in Karnataka? Q.11) Which of the following National Park is not located in Maharashtra? Q.12) Which of the following National Park is not located in Rajasthan? Q.13) What is the tagline of ECGC Bank? Q.14) What is the tagline of Oriental Bank of Commerce? Q.15) What is the tagline of Standard Chartered Bank? 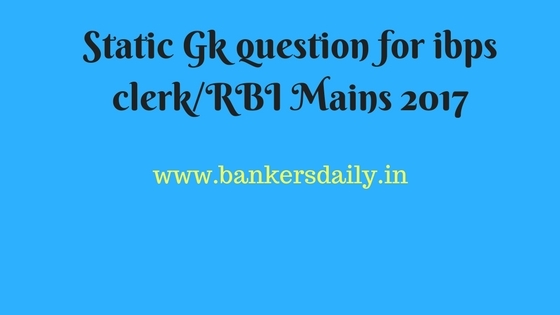 Q.16) What is the tagline of ICICI Bank? Q.17) What is the tagline of HSBC Bank? Q.18) Which of the following is not the dance of Karnataka? Q.19) Which of the following is not the dance of Uttar Pradesh? Q.20) Which of the following is not the dance of Himachal Pradesh? Q.24) BOVESPA Stock Exchange is located in _______. Q.25) IPC Stock Exchange is located in _______. Q.26) IBEX35 Stock Exchange is located in _______. Q.27) Who is the chairman of SEBI? Q.28) Armistice Line is between _______. Q.29) Who is the chairman of NHB (National Housing Bank)? Q.30) Who headed the committee to look into the implementation of One Rank One Pension (OROP) scheme for the ex-servicemen?